I made this cheese but it did not turn out as creamy as your pictures show, my is more of a hummus texture but still tasty. I was wondering about the raw cashews., I can not find them in my area could regular roasted cashews work if I soaked them? Hi, looks like a great recipe and I want to try it without the agar-agar. Should I then reduce the amount of water? Thanks! I modified slightly… left out the agar agar and didn’t use any maple syrup. It made a nice, tasty spreadable “creem cheeze”. The color was more brown than yours…I think my smoked paprika might be darker than what you used… so I added a little more tumeric and some annatto, which didn’t alter the taste very much. I love the taste of this chest but disappointed do to fact that it came out soft. I was hoping for a more firm Chez. Don’t no what I might have done wrong. I did everything as the recipe said. I did not use whole cashews, but cashew pieces. Don’t no if that might have been it????? Hi, I’ve never made nut cheese yet but really want to! wondering if this require a special strong blender or can I use a regular one? (not modern or very strong) Thanks! Hi! This an awesome recipe, and I’m excited to try it! Do you know why the shelf life is so short? I’ve rarely heard of any foods, besides seafoods and meats, that aren’t safe at eat after such a short time. Has anyone tried to make queso with this? 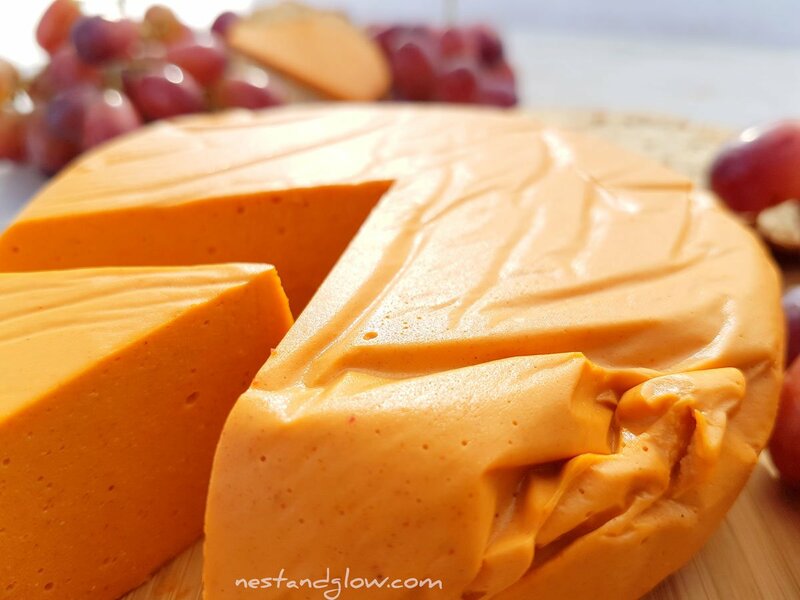 I see the comparison with velveeta and have been trying to find a way to make a vegan queso! 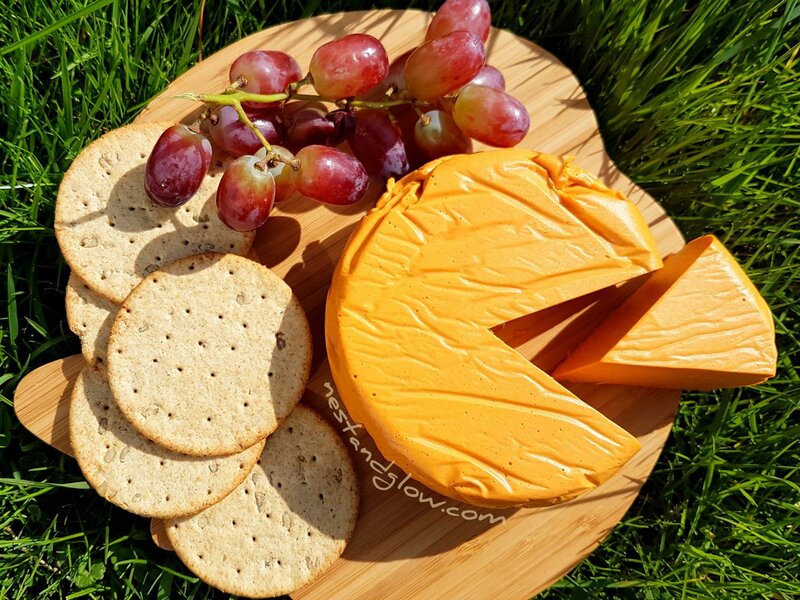 I’ve just started experimenting with making Vegan cheeses. Have you tried freezing this one? I don’t understand why people want any sweetness in their cheese? Most real cheese doesn’t have a sweet flavor. 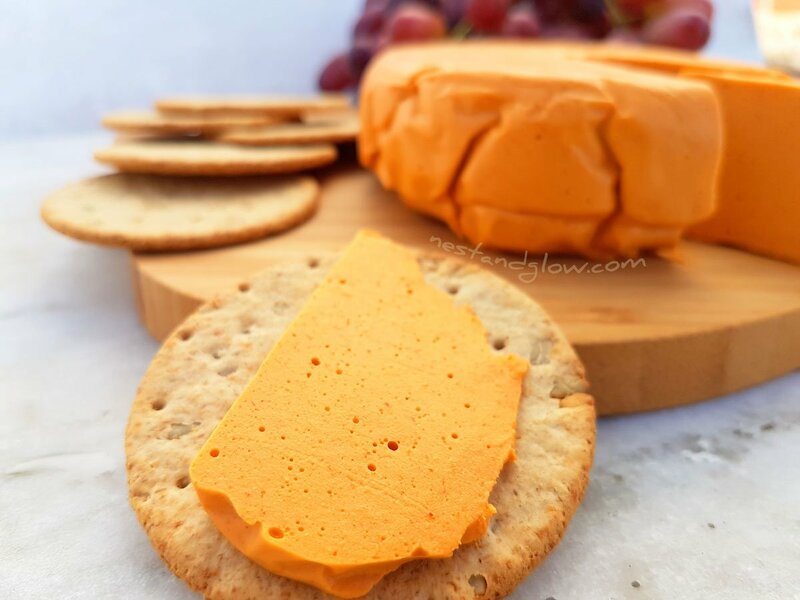 That’s the reason I don’t like most of the store bought vegan cheeses, they are sweet. So, I am looking forward to making this cheese without the maple syrup. Just an amazing taste and recipe. I wasn’t sure about the maple suryp so left it out. But really I recomend to always add it – you don’t taste it and its still savoury but the sweetness really lifts the cheese. It’s like a better version of smoked edam. You could used dates if you prefered though. Marmite can be used instead of nutiotional yeast – not quite as good but much cheaper and still yum yum yum! Thanks! I’ll give it a try next time I make it! 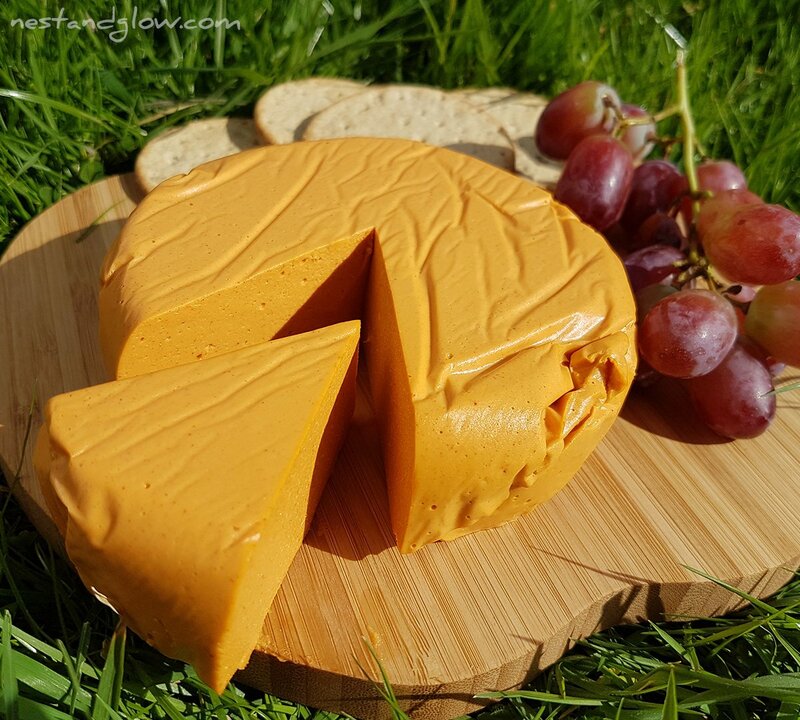 Love this recipe, it’s the best vegan cheese I have ever had! Love it sliced on crackers or just by itself. 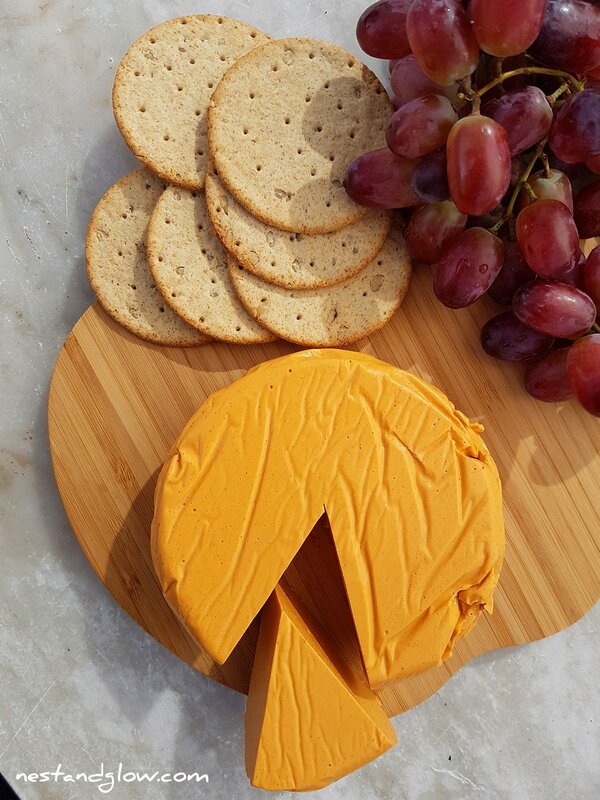 Everyone try this cashew Cheese asap! Can xantam gum or potato starch be used instead of agar agar? Hi there, afraid not – it won’t set. Just leave out the agar for a cashew cheese spread though. I made it without agar agar and maply syrup. I like the taste overall, but it is too sweet for me. How can it be adjusted to taste more savory? Hi there, definitely leave out the maple – I was aiming for a sweet edam style cheese with this. It’s tricky with the sweet cashews and paprika to make it less sweet. I would try my sunflower cheese for something that is way more savoury. Hi! Made this today, mine turned out yummy- just not solid enough and with that hummus texture.. im wondering should i simmer it with the agar agar a bit or just add more agar agar next time? I stirred it all the time and no lumps formed..
Hi, glad it tasted yummy! If there was none stuck to the bottom and was simmered to activate it you might just want to try adding a bit more agar – maybe some powder is less potent? Let me know how it goes! Thank you Bastian. This is delicious. Currently eating it on your quinoa bread. I love your recipes and am looking forward to getting your book for Christmas. I’ve been plant based for 5 and half years and I feel like at long last I have found the website I’ve been looking for. Healthy and delicious. Thank you ???????? No thank you for your kind words Josephine! So nice to hear. Really hope you enjoy my book and all the future recipes on the site. I tried to make the cheese yesterday, the taste turned out to be nice, but the texture is not firm. I cannot slice it, as it is kind of the spreadable kind. What can I do to make it sliceable or even grate it. I did a half recipe and used agar agar powder and nutritional yeast flakes (double the amount). Thanks ! Hello, It maybe due to the strength of the agar or some got stuck to the bottom. I would add more agar and make sure to constantly stir so none gets stuck to the bottom of the pan when heating. Hi, I will try that. Do you recommend adding cornstarch instead of agar agar? And would you soak the cashews at least 8 hours before putting them in the blender (and then add less water)? The video says 1 1/2 cups of Cashews…but the instructions read 1 cup. It didn’t set firm, but will try more agar agar next time. Hi, I’m looking forward to making this tomorrow….I’ve got Vege Set instead of Agar Agar, will this work instead, and should I use the same amount? Hi there, sorry for the delay in getting back to you – the first week long break i’ve had from the site in almost 3 years. Afraid to say that I don’t think that will work, it sets differently and some people have said it doesn’t work. But do follow the directions on the packet and use the amount they recommend for setting a liquid mixture. Let me know how it goes. I’m looking forward to trying this recipe. What about using gelatin as a replacement for the agar agar powder? Hey there, as a vegan site I can’t recommend gelatin. But if you don’t have a jelling agent you can leave it out for a spread. Thank you so much for the recipe. It is a second cheese I did the following your recipe. Cheese came just delicious as well as pistachio cheese.